t*rexes and tiaras: Friday Favourites 085.. I've been having a recent wedding outfit dilemma. Having been invited, despite my best wishes, to various weddings this year I have been trying to find an outfit which would be suitable for all. A bit of a tall order, perhaps as one of them is a summer garden party affair with a greenhouse and will hopefully be on a rather sunny day, whilst the other isn't until late November. That said, I think I may have cracked it. Here's what I think I'm going to go with. 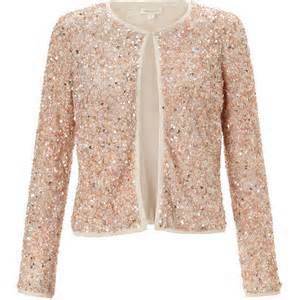 001: I think this sequin jacket would be perfect to add the day-to-night glamour for the summer wedding and in fact to just about any outfit. I'm imagining it layered over a full-skirted dress with a pair of Mary Jane heels, perhaps with a sparkly clutch bag. The pretty sequin detail would be perfect to dress up a more everyday outfit as well, though. Already I'm thinking up ways to wear it with a pair of leather shorts or a pencil skirt for the office, so it would pay for itself ten times over if we consider cost per wear, I'm sure. 002: I can't quite put my finger on exactly what it is about this dress that I love. It caught my eye on the Peter Hahn site and I've not been able to stop thinking about it since. It's so simple; a pretty powder pink colour which would go with just about anything, in just about any season. (I'm thinking of wintery powder pink with a fur jacket or bolero for the November do). Versatile indeed. What do you think? Would these work together as a wedding outfit? And also separately as wardrobe staples, in a bid to shop more sensibly? 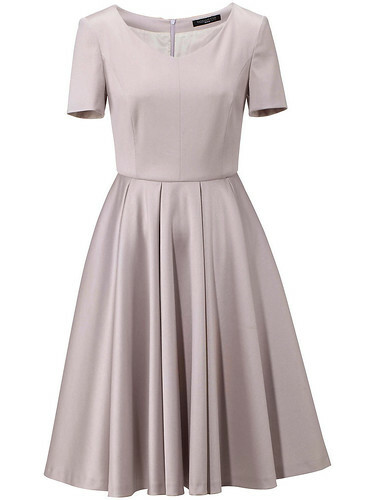 What would you wear to a wedding? I really really am tempted by the sequins! Yes, yes, yes to the sequin jacket! May have to have a look for it in the shops tomorrow! This is a perfect wedding outfit. The dress is just stunning and the sequin jacket, well.... It has sequins, whats not to love. I'm so tempted by the jacket!